As this is a gun blog, of course I must have a post on firearms for the Modern Militia. To keep w/ the theme of US Army compatibility that I've maintained, I'm going to first present the original military issue and then what would be complementary for the Citizen Soldier to possess. Since we on average are unable to procure select fire weapons, that is not going to be presented as an option but civilian equivalents that can assist in the ease of logistics will be. The standard US Infantry field weapon is the ubiquitous M-16/M-4 series rifle. 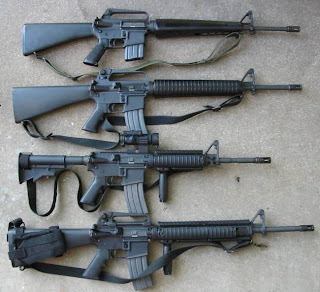 Obviously then, since the M-16 was based off of it, the ideal firearm for Militia compatibility would the the AR-15 (or its many clones) chambered in 5.56 NATO. This allows for the ease of obtaining not only ammunition and magazines, but many replacement parts as well as well as an increased familiarity should a general issue occur. Next up for preference would be semi-auto STANAG compatible rifles in 5.56 NATO such as the FS2000 Carbine or Robinson Armaments M96. * These provide the magazine and ammo compatibility but w/o M-16 familiarization. Non-STANAG 5.56 NATO semi-autos would be next up for preference such as the Ruger Mini-14 *. Same ammo but bring your own magazines. Bolt-actions and Single Shot rifle chambered in 5.56 NATO round out the list for compatible infantry rifles. Keeping w/ a military issue mindset, some Remington 700's *come chambered in this. 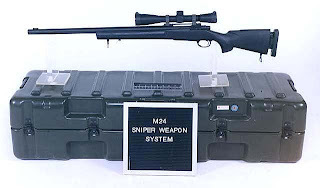 The standard current issue sniper rifle is the M-24 Sniper Weapon System. Basically this is a suped-up Remington 700 chambered in 7.62x51mm NATO (.308 Winchester) or .300 Win Mag. w/ a Leupold, Ultra M3, 10 Power scope. A quality bolt-action chambered in the same should have a similar effect when being handled by an experienced shooter even though most don't train out as far. Keep practicing. Since the M24 SWS replaced the M21, I'm going to combine it, the M25, and the M14 under the same category of Designated Marksman Rifle , 'Sniper Support Rifle', or 'Squad Sniper Rifle'. The primary differences being that the training isn't as far out on range and is also capable of providing some level of suppressive fire out to a farther distance for the unit. An accurate select fire weapon that had a short lived history as a standard issue rifle in between the M-1 and M-16, the M-14 and/or its many variants have been adopted as a Designated Marksman Rifle and is still in use as a Sniper Rifle in some units. It is chambered in 7.62 x 51mm NATO (.308 Win). Civilian M-14's in semi-auto under various names are available as well as other long barreled semi-autos providing similar accuracy*. US standard sidearm is the M-9 Baretta. For all intents and purposes, a MilSpec Baretta 92 in 9 x 19mm Parabellum. Civilian equivalents available everywhere except Washington DC and Chicago, Il (unless you're a criminal or politician but that's redundant). Along w/ your firearm, you'll also need accessories. I specifically didn't include these in Basic Field Gear for the specific fact that you wouldn't need a magazine pouch if you're shooting bolt-action etc. A good "Battle Load" is 4 or 6, 30 round magazines for a semi-auto or 50 rounds for a bolt-action. Thinking you can carry 20 magazines of .308 along w/ your other gear up and down hills will only result in your buddies having to practice their medical skills. The type of scope you use (if any) also depends on purpose, preference, and firearm. And don't forget a cleaning kit. As for these and other add-ons, use some common-sense. In trying to be "Tacti-cool" you may end up looking like a Tacti-Fool. As stated in the beginning, this listing is along the idea of compatibility. If you can't handle an AR-15 to save your life but can shoot the nuts off a fly at 300m using an SAR-1, guess what you should do? Use the SAR and bring your own ammo. I own an NDM-86 and practice w/ it fairly regularly so I would be more effective w/ it than if someone handed me an M-14. At least until I ran out of 7.62 x 54R. Then I have a really expensive club. *Note1: I'm not endorsing specific models but only using them for examples of the concept. **Note2: Ammunition issues. It has been noted that Military 5.56 NATO has a higher pressure than civilian .223 Remington. Some rifles such as the AR-15 and Mini-14 are supposed to be designed to tolerate the difference but check w/ the manufacturer of your specific model for details. I have been very impressed by your Modern Militia series. Actually, doing something along those lines was what I envisioned when I registered my domain names. Kudos on a great start & thanks for the thought that went into its preparation. Thanks much. I'm enjoying putting the posts together as much for the little details I'm picking up during the research as for the original ideas. Preface: With rights come responsibilities. The responsibility that comes with the right to keep and bear arms is the opening clause of the Second Amendment--a well regulated militia is necessary to remain free. 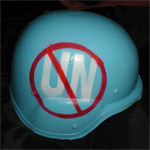 So, to any who are interested in taking seriously the responsibility that comes with the right to keep and bear arms, feel free to check out the modern militia (not racists bent on overthrow of government) at http://www.awrm.org. Another designated marksman rifle option is the FAL. On ammunition issues, anyone acquiring a militia rifle should specify a "5.56 NATO" chamber when ordering the rifle or upper. The NATO spec chamber can fire both mil-spec 5.56 (M193/SS109) ammunition and civilian .223 Remington safely. Firing 5.56mm mil-spec out of a .223 marked chamber will result in the gun blowing up in your hands. .223 chambers will not tolerate the 10K psi higher military chamber pressures for long. It generally costs nothing more to get a NATO spec chamber. For rifles already assembled, they will be marked "5.56mm" or ".223" for mil-spec and civilian chambers, respectively. Occasionally (such as some DPMS rifles) will be dual-marked. All of my AR pattern rifles possess mil-spec chambers. It's a pretty easy requirement to meet provided you are aware of it. Third, As you know my Dad was a Marine,Pilot I see in more than one photograph him in his flight suit, standard side arm, but what appears to be a Tactical Shotgun, Have any Ideas if this was a standard pilot arm, or just something Dad carried for extra protection. It wasn't standard from what I'm aware of. Of course it could have been a unit SOP. I'ld go w/ your dad not trusting in a pistol in case he got shot down. 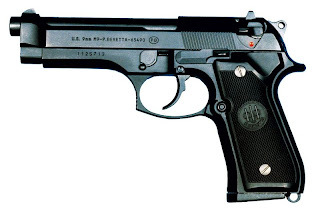 Aquire Baretta M-9...hmmm? No thanks, i'll stick with the 1911 and bring my own ammo. On a more serious note, I have a suggestion for your excellent series. 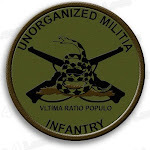 If the militia is ever needed in the capacity of actually firing shots, consider posting your thoughts about what we should aquire and keep on hand to give to someone who is not a gunny? What do we keep in the vehicle for those who have never used a weapon before? I ask this because I believe we should be prepared to help those who never imagined to be in a situation where the militia is mobilized within our borders. In short, show them once and for all, that they are part of the militia too. As far as extra gear in general, this could become difficult, but as far as an extra firearm, what are your thoughts about keeping a couple of extra Mosin Nagants lying around(M44 preferred). They're dirt cheap, accurate, simple to operate/clean and vitually indestructible. Which reminds me, about 60-70% of the Mosins I've looked at, the last 1-2 inches of the barrel near the muzzle is either heavily pitted or total crust while the rest of the barrel is pristine. What happened to these? It looks as though they were stored in the dirt muzzle down. To sum up, what gun do we give to Kelli? I've actually read some books about the best uses for non-combatants in a MASCONFLAG situation. And I don't mean as shields or cannon-fodder. I'll add that as a possible chapter later. Thanks. airsoft. It's all I'd trust him/her/it with. There are lots of non-gun people who haven't been actively working to destroy my rights that I arm up first. 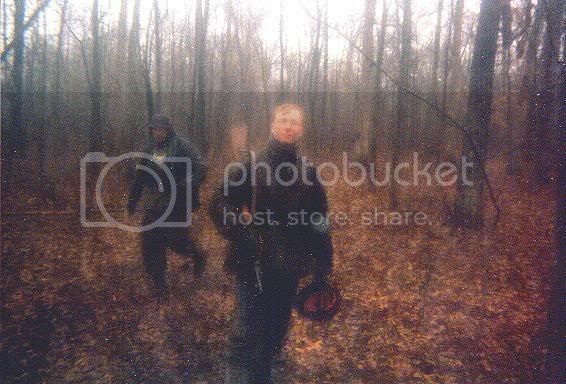 kaveman, your question has been discussed at length at awrm.org, and the consensus seems to be that the SKS is a good rifle to have on hand for people suddenly finding themselves being part of the militia. The Mosin-Nagants, particularly the M38 and M44, have recoil that could quickly dissuade new shooters from being partakers in the melee. The obvious downside to the SKS over the Mosin-Nagant is price, but 7.62x39 ammunition is more easily found and otherwise acquired than 7.62x54R. Restaurant CCW Ban Repeal passes VA senate.